Lets be honest, Little black dresses are a staple item every girl needs to have in their wardrobe. They are super practical, versatile, wearable and lets be honest black suits everybody! 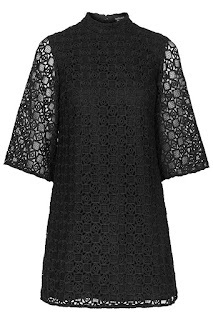 At the moment Topshop literally have the most incredible LBDs for all occasions, and I can't get enough!! This dress above is actually an oldie of mine, which I'm totally ashamed to say has been hidden away for ages as I've had nowhere to wear it but as the festive season is fast approaching I definitely think that this one is ready for a little trip out. Im crazy for the bead detailing to the shoulders! Its beautiful! Its got a super flattering design also! I love the mesh neckline and the skater hem as it shows you off in all the right places and draws a lot of attention to the detailing of the embellishments on the shoulder, and there's no distractions from this by including a tight bodycon design (which I love). This is also a little helpful hint that if you aren't up for buying a new dress yet and want to rework an older one in your collection, just grab some new accessories and some new shoes and change the outfit up a little bit! I love little black dresses, you literally cannot go wrong. I particularly love wearing them with bright colours such as electric blue, or red etc. I think you cannot go wrong with a bright red lip and a smoky eye either! Particularly at this time of year. 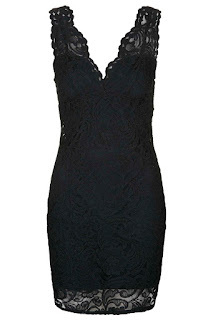 I have been swooning over so many of the LBDs on the topshop website lately so below I've included a few for you!! Be sure to go over and grab yourself one, there's a style for absolutely everyone! !